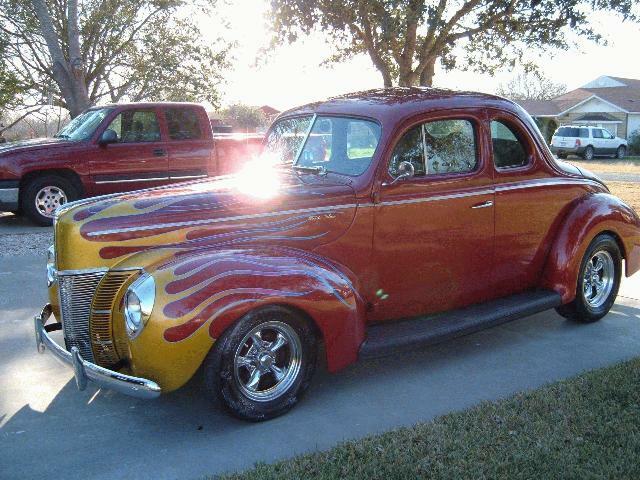 '40 Ford Coupe street rod; Candy red/burgundy two tone/candy gold flames; 350sbc, 700R4, GM 10bolt. A/C, power rack and pinion, power front disk brakes. Gray interior- Silverado power seats, nice AM/FM/CD, VDO gauges, leather tilt wheel; American Torq-Thrust wheels. Great cruiser- 20+ mpg. Call 361-296-3794 or email garnerjay@yahoo.com for additional info/pics.